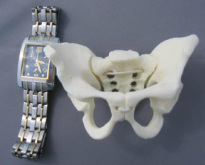 The large flexible pelvis is life-size and lifelike with movable flexible joints. The symphysis pubis and sacroiliac joints are flexible, unlike typical anatomical models. This is an excellent teaching tool. Made in the USA. 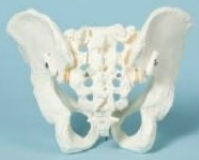 The Small flexible Pelvis is ideal for carrying in a lab coat or pocket. The sacroiliac joints and the symphysis pubis are flexible, like living anatomy. Made with strong elastic cord and durable plastic. Made in the USA. High-quality natural cast from real foot, life-size 25cm/10" length. classroom. Made in the USA.